Barbaresco is perhaps one of the most muscular red wines on the planet – pale yet full-bodied, firmly tannic, with high acidity. In youth it gives earth, violets, roses and tart red fruit, becoming more tarry, leathery and liquorice-like with age. It is delicious with hearty winter dishes of slow-cooked beef, rabbit, lamb, venison, white truffles, porcini and egg pasta. Barbaresco used to be perceived as a lighter version of Barolo. In the last few decades, the quality and style has changed considerably, thanks to global warming, and improved winemaking and viticulture. In the 1960s, the norm was that wineries bought grapes from smallholders. 90% is now estate-bottled. The first single vineyard Barbaresco was released in 1967, with an explosion of ‘Crus’ in the 1980s. Having said that, the quality of generic Barbaresco is now so good that there is less distinction between it and certain Crus. The difference relates more to style than a step-change in quality. Barbaresco is made from Nebbiolo, named after the ‘Nebbia’ – the Autumn fog prevalent in the hills of the region. It is difficult to grow- it needs a lot of heat, is late ripening, thin-skinned and prone to disease. And it’s low-yielding. Better clones are now being planted, thanks to research by the University of Torino. Barbaresco is warmer than Barolo, enabling Nebbiolo to ripen, thanks to lower altitude, warm sandy soils and proximity to the river Tanaro. It’s also more sheltered. Since 1997, summer continues through to September, enabling Nebbiolo to ripen more easily, even on east-facing sites. Nebbiolo is now being planted in the Langhe hills, often replacing Barbera and Dolcetto. These young vines are finding an appreciative market, labelled as ‘Langhe DOC,’ offering very affordable prices. Top ranking Barbaresco producers include Gaja and Giacosa. The next level includes Produttori del Barbaresco. This premium co-operative was set up in the early 1960s by the local parish priest, in an effort to get small growers to co-operate. This made sense in a wine region where the average holding is less than 5 hectares per grower. The association now has 54 growers, who farm 100 of Barbaresco’s 700 hectares. There is a waiting list of growers who wish to join; some years ago they allowed in four growers, according to their MD, Aldo Vacca, who is considered one of the foremost authorities on Barbaresco. Produttori’s members have vineyards in all nine of the designated Crus. An interesting point is that its members must sell all their grapes to the Co-Op. Grapes are fermented in cement or stainless steel, with a 4-5 week fermentation being the norm for Barbaresco. Aldo Vacca explained that indigenous, specially cultivated yeasts are now being used, which are like “yeasts which went to the gym” – much more capable of fermenting this rich must. Wines undergo minimal intervention. Malo-lactic fermentation takes place over winter. Barbaresco must be aged for a minimum of two years, at least 12 months of which are in oak. The Crus are aged for at least three years, with only one racking per year. Nebbiolo doesn’t interact as much with oak, so very old large oak barrels are used, traditionally Slovenian, but increasingly French. In January, they thrown open all the windows to allow the tartrates to precipitate naturally. The wines are neither filtered nor fined. Modern Barbaresco drinks well from about 6-7 years of age, but can continue to improve for up to 20 years. 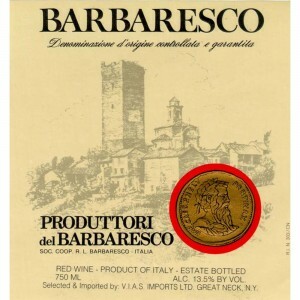 Produttori del Barbaresco wines are available through Karwigs in Ireland. Langhe Nebbiolo DOC 2014 deliciously dry, savoury, tarry earthiness, with a hint of spice. Barbaresco DOCG 2010 Savoury, dried cherry and pepper, with a firm, tannic very long finish. Barbaresco Riserva DOCG ‘Pora’ 2011 is very approachable at a young age, a characteristic of this Cru. Supple, with rich mouthfilling savoury character. Barbaresco Riserva DOCG ‘Pora’ 2009 fills the palate with its super texture. Dense, savoury and tobacco characters dominate. Barbaresco Riserva DOCG ‘Sordo’ 2009 – distinctly more powerful with a broad, rich almost silky mouthfilling presence from mid to end palate; plenty of animal savoury notes.